Do you want to reduce your air consumption? Have you often wondered why the Divemasters seem to finish a dive and still have half a tank left over when you are at 50 bar? How Does Buoyancy Affect Air Consumption? Think about diver who is effortlessly gliding along with the current Vs a diver who is having to constantly kick to stay off the bottom. Which diver is breathing the heaviest? Now imagine a diver who is swimming slowly at a consistent depth Vs a diver who is going up and down and up and down due to emptying air from their BCD and then adding more air back into the BCD, dumping it again, adding more again and so on. Which diver is using most air on their BCD? Which diver has to exert themselves the most through kicking due to increased water resistance, one who is in a horizontal streamlined position or one who is in a vertical (head up / feet down) position? 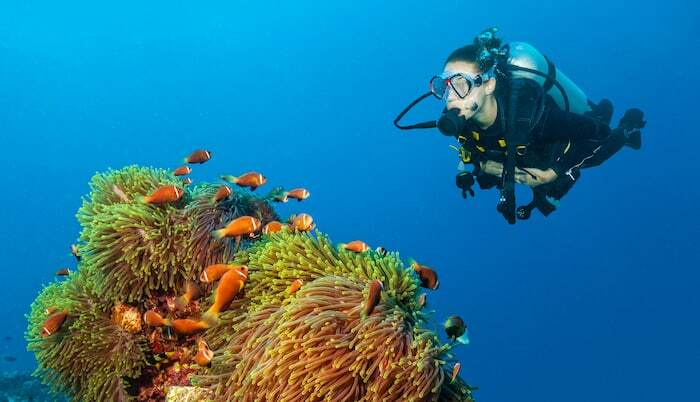 What about a diver who is relaxed and hovering to look at a critter on the reef versus a diver who is head down and kicking down to avoid floating upward? Which diver will have the highest air consumption? All of the above situations result in one diver having to kick more (which is exercise) and therefore breathe more heavily or use more air in their BCD. 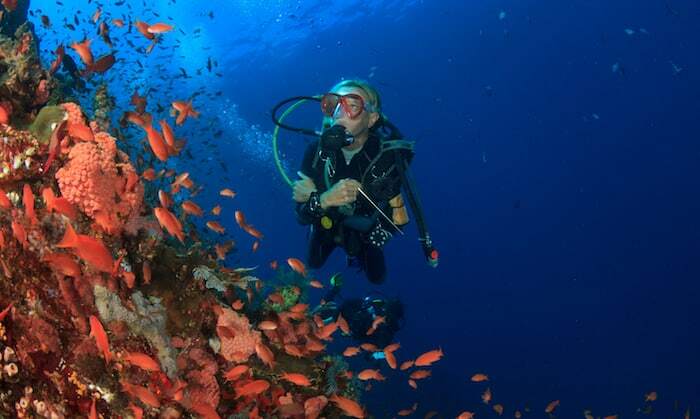 Divers who have mastered neutral buoyancy do have to exert themselves so their breathing pattern remains unchanged – they do not start to pant or need to take bigger breathes. Neither do they need to waste air by adding it and later dumping it from their BCD. Less effort + less adjustments = lower air consumption + longer dive times. Neutral Buoyancy means that you are neither sinking down or floating up. You are floating, mid water and rise and fall gently as you breathe in and out. Because you can effortlessly stay at one level you do not need to exert yourself or adjust your equipment to compensate. This means you’ll be able to enjoy increasingly longer dive times as your air consumption improves. It’s impossible to achieve neutral buoyancy if you are not carrying enough weight, likewise it’s not a good idea to compensate for being over weighted by inflating your BCD. If you are carrying just the right amount of weight, you will have the smallest amount of BCD inflation. That means less drag and more efficient finning. Less BCD inflation also means less buoyancy shift with depth, so you’ll need to make fewer adjustments. All of these factors combined result in lower air consumption! How Many Weights Do I Need? Correct weighting depends on your personal buoyancy needs and is influenced by a number of factors—from the composition of your body and where you are diving in the world to the thickness of your wetsuit.  Two Fish Divemasters and Instructors have years of experience in gauging peoples weighting needs – ask them for advice! A relaxed diver with a full tank and an empty BCD should float at eye level at the surface, while holding a normal breath of air. As you exhale you should gently start to sink. This test is better done at the end of a dive when your tank is on 50bar. If you make this check with a full take you will find that you are underweighted at the end of the dive when the tank has emptied and become more buoyant. And yes – it does mean that at the beginning of the dive you will be slightly over weighted to ensure that you can stay down for the safety stop! Try to make only small adjustments to the air in your BCD. Add and release air in small increments only. After each adjustment give it time – take breaths in and out to see if you rise and fall with your breathing. You may have already done enough without adding or releasing more. During your safety stop try letting all of the air out of your BCD and take breaths in and out again. If correctly weighted (with a tank that’s holding 50 Bar) you should rise and fall slowly with each breath. Make note of what happens and adjust your weights accordingly for your next dive. As a general rule – if you need a lot of air in your BCD at the end of the dive to stay neutrally buoyant you are overweighted. If you are struggling to stay down with an empty BCD you are underweighted. Make a note in your logbook of the amount of weight you carried; whether you were diving in fresh water or saltwater; the thickness of your wetsuit and if it was long or short; and if you felt overweighted or underweighted. This will help you to gain an understanding of how many weights you need in different environments. If you’d like to improve your buoyancy a great way to get started is to take the PADI Advanced Open Water Course. If you are already Advanced Open Water certified and would like to take learn more, maximise your buoyancy performance, or if you are working towards your PADI Master Scuba Diver certification, why not sign up for the PADI Peak Performance Specialty Course? 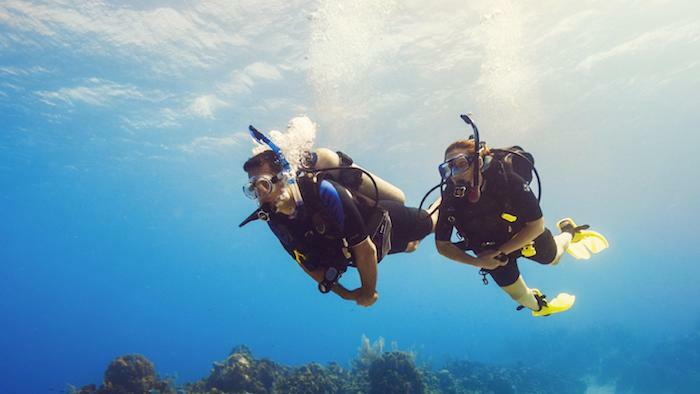 You’ll be making longer and more comfortable dives in no time!